This morning three of us Tucsonans, Sue, Kim and I drove up I-10 to our State Capitol to help the Phoenix type folks unwelcome Bush as he came in to Mesa to visit the military contractors at visit to the company was probably only arranged so he could use Air Force One toSilverado Cable Company -- this come to Phoenix forMcCain fund raising events. A couple hundred folks gathered on S. Dobson Road at 1st Avenue. The crowd was quite diverse and included Phoenix CODEPINK, local folks, young and old people, folks from Flagstaff -- first time protestors and seasoned professionals. It was difficult for me to get a picture of the lineup of a couple hundred people along the street as I couldn't get into the street or across the street due to the police presence. Met up with Arizona Liz (here shown with Kim & the "Balls" sign.) Liz has been a busy little pinker in D.C. representing our state with other CODEPINK women from around the country. I've written about her being assaulted when Desiree managed to let Condi know that the blood of scores of thousands is on her hands. Overall this was a good event with lots of people venting at the motorcade as it drove by so as to let Bush and Co. know that he isn't welcome here by regular folks and McCain is not being supported by most folks in Arizona now either. Liz walked out into the street with a huge sign that said "Pray for Insane McCane" as the motorcade was passing by on its way to the fundraiser that had been moved to an undisclosed location after they couldn't sell enough tickets to have the event at a large arena. I hear it was also because of the protests to some degree. The most disconcerting thing that happened was a cop with major camera apparatus who was filming every one in the crowd. When one young woman asked if that was going to get her on a list, the cop put his camera down and came over and got in her face and yelled, "What did you say to me?" She was quite taken aback and obviously a bit frightened. First, why are cops taking pics of people lawfully gathered together to send a message to the administration. Secondly, why did he have to act like and A**hole? Unfortunately my pic of him taking a pic of me turned out blurry. I'm putting it up any way. Then is was on to Cesar Chavez Plaza in downtown Phoenix to Pink Slip Bush. I don't have any pics of that as I was one of the women who had to physically drag Bush away from the adoring cadre of Billionaires for Bush to that we could Pink Slip him. You can see his back and one of the Billionaires in the pick I snapped as we were getting ready to grab him. I will have pics of that sent to me tomorrow and I hope to have them up tomorrow evening. Then it was on to grab a bite to eat at Rosie's (10th and Camelback) to refuel and hear a few words from Rae , CODEPINK 's national liason with local groups. There were Gilbert folks there who were PDA affiliated, and folks from various other groups affiliated with the Phx End the War Coalition. After that we then decided on the way to where we were crashing, that we would stop by and chat with Blair and his buddies who are all associated with 9/11 Truth. Bryce is fasting for the next few weeks to bring attention to our nation's "Hunger for Truth." If you go to this site you can find out about it. It is always good to connect with other groups who want the same end result as you even if you differ on the details and issues. 2) they also were worried about the number of protesters coming from around the state and even beyond Arizona's borders -- it would be really embarrassing for the party loyalists and corporate stooges to be outnumbered by protesters. So they changed the venues. The fundraisers are now just listed as "at private residences" and I would suspect that these residences are in walled against the riff raff gated communities. The Bush schedule for Tuesday shows him arriving at Silverado Cable Company in Mesa, AZ at 3:05 p.m. After King George and Prince John zip off to private residence land everyone will head for Chavez Plaza, downtown Phoenix, to rally together against any continuance of war, war crimes, and governance by war criminals -- there will be music, speeches, skits and general reconnecting and strengthening of the bonds and determination of Arizona activists, Democrats, and veterans groups as they seek to let the country know that Arizona people don't back McCain. Downtown Phoenix is a Bush-McCain Free Zone! 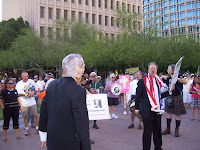 Tuesday’s Phoenix Downtown Rally and March Still a go – 4:00 p.m.
Also, Big Protest Against Bush in Mesa- 2:00 p.m.
Music, speakers and a celebration! 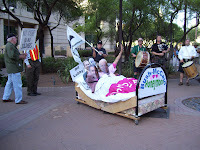 Watch CodePink Phoenix “pink slip” the prez. 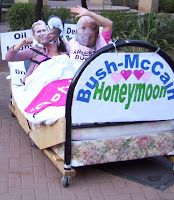 McCain in Bed with Bush! 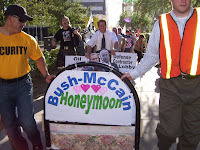 Help us chase embedded McCain & Bush out of Phoenix. Park on the street (free after 5 pm) or in surrounding parking garages. Bring water to drink and sun protection. Many of you have heard that President Bush's fundraiser for John McCain had to be relocated due to the promise of massive protests (and poor ticket sales!). They may be able to run, but they can't hide! Here's the most up to date info on where to be and when to get there. Parking is available at the Main Street Market Place on Dobson between 1st Ave and Main St. I will post impressions and pics after these events tomorrow. Hasta. Precedent Setting Election Integrity Ruling In Pima County Superior Court. Every once in a while our Old Pueblo manages to do something that impacts world history. A ruling on Friday addressed the right of the people to have access to election records and databases. The county had argued that releasing such records would be a security risk. Pima County Superior Court Judge Michael Miller ruled on May 23, 2008 for the release of databases for the primary and general elections in 2006. Of course the Arizona Daily Star hid the information about this landmark ruling deep inside the paper even though this news made the Daily Voting News. Judge Michael Miller Friday issued his under advisement ruling declaring that the interests of the state and public outweighed unproven vote security concerns voiced by county attorneys and witnesses. "All existing electronic databases must be disclosed," the judge ruled. It is the first time a judge has ordered any governmental entity to turn over all records from electronic elections and ballot tabulating systems past, present, and future to political party officials for scrutiny for signs of tampering. "Everyone is going to be looking at this ruling and realize that electronic records are public records," said Vince Rabago, chairman of the Pima County Democratic Party. Earlier this year Pima County Board of Supervisors decided to release the database records for the May 2006 Regional Transportation election. The Pima County Democratic Party had brought suit last year against Pima County for the release of electronic voting records for the 2006 elections under the basic logic that electronic elections require electronic monitoring. Pima County Dems have more guts and good sense than the state level party as a whole I would say. The judge has not yet ruled on a request that Pima County pay the Democratic Party's legal fees that reportedly run into the hundreds of thousands of dollars. With the advent of Diebolt voting machines that can be easily hacked, election results locations in the United States have come under suspicion of tampering since before their adoption as voting technology. Arizona is one of the places leading the way for requisite scrutiny of electronic voting databases, in my humble opinion, due to a few dedicated folks, such as John Brakey. Individual action does make make all the difference in the world between freedom and servitude. I think John's comment on a Tucson Citizen article from April of this year is worth republishing. DEMOCRACY DEPENDS ON WHAT “WE THE PEOPLE” DO! Folks, Election Integrity is NOT about the RIGHT or LEFT. It’s about citizens challenging injustice, greed, and corruption. Yesterday we stood together in court NOT just for our County; but as Americans concerned for our Country! Fact: Since then, Huckelberry's Election Department has been ILLEGALLY printing election summary reports of early ballots (WHO'S WINNING AND LOSING) way before Election Day. Fact: County Manger Chuck Huckelberry has known about the back door to our voting system since 1996. That's when Huckleberry authorized Bryan Crane to use that “back door” to merge two databases. What Crane did wasn’t in the manuals. Huckelberry and the country ridiculous delusional defense for keeping the databases secret -- that releasing them would result in "Mayhem and Chaos" – lost! Casting secret ballots is essential in our democracy. Counting them in secret is contrary to everything our Founding Fathers fought for. I’ve learned, after three years of investigating Pima County Government, that it's NOT JUST voting that makes democracy, its TRANSPARENCY IN COUNTING VOTES and we still have a long way to go getting it right in Pima County. Vigilant Patriots, practicing the rights of citizenship in a democracy with civility, can make the Difference! John Brakey, co-founder of AUDIT-AZ (Americans United for Democracy, Integrity, and Transparency in Elections, Arizona) & Co-Coordinator Investigations for Election Defense Alliance. Arizona Fair Elections is another source of information on this topic. I previously wrote about related Arizona and political manipulation of voting records in 2005. Arizona may have a reputation for a quirky libertarian streak, but we have Clean Elections and now a precedent setting ruling that helps to insure election record transparency. The western states gave women the right to vote before the nation did too. Yee-ha! Now if we could just translate this fierce patriotism into booting McCain and Kyl from office, well, then I would be downright proud to call myself an Arizonan. 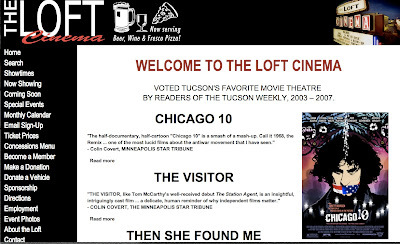 Last night I went to see the Chicago 10 (2007) at The Loft last evening. Director Brett Morgan, a combination of historic footage and animation, this project has been panned by corporate media critics and surprisingly suggested as a potential educational tool for parents to use to instruct mature teens about history by other reviewers. Most film review sites seem to have a mixed review. My original experience with the Chicago 8 (10 now per this movie's inclusion of defense attorneys Weinglass and Kunsler) is just as divergent from the mainstream as my critique of the movie. I won't say watch it or don't watch it although I definitely lean to the former. That is up to you. What I find most compelling about the film are things that few if any of the "top" reviews choose to comment upon -- metacomentary, framing for a new generation, the ability to capture the essence of a very complex time. Actually, for me all the events of 1968, MLK Jr.'s assassination, RFK's assassination, the Chicago Democratic Convention, will always pale in comparison to my brother catching a gut full of shapnel as he lifted a mortally wounded buddy into a medivac chopper on his birthday on August 4th, 1968. I was 11 years old. Of course there are the 2008/1968 parallels. War that the country no longer supports, a divisive Democratic party that could end up losing the fall election to the Republican nominee. A profound sense of hope and and equally profound sense of despair that pulsates just below the surface of every political discussion. The use of now common academic/analytically informed protest tactics and the acute understanding of the role of the media in shaping political thought and dissent was brought to mid/late 20th Century U.S. by the Yippies. The contemporary grandfathers of Billionaires for Bush, CODEPINK, and YellowCakeWalk were Abbie Hoffman and Jerry Rubin. (Be careful crossing the street all you street theater of today types.) My life partner in cultural critique says I should mention The San Francisco Mime Troupe. The concept of "The Jester" who embodies the upside down analysis of things not spoken about in kingdoms and monarical courts is an ancient concept. Successful street theater is the stuff of intellectually trained and culturally astute critics of the powers that be. Laughter mixed with the possibility of death is edgy and illustrates that all humor comes from discomfort. No other film of which I am aware of so effectively presents the layers of meta-messages that bombarded the TV watching U.S. population in 1968. The trial scenes in the film were exclusively presented as animation -- this perfectly addressed the surreal nature of the trial.... of course it also was necessary as there were no courtroom cameras allowed in the winter of 1969 and 70 the date of the trial. I definitely think that Tucsonans of the activist stripe or anyone interested in the presentation of historic information to contemporary audiences would be rather negligent if they did not take advantage of the local showing of this film on a large screen and get over to The Loft between now and Thursday, May 29th, 2008. This made my stomach pitch and tears well in my eyes. No one has the right to casually mention RFK's assassination. If you haven't already overdosed on the topic, watch Keith Olberman's special comment from his MSNBC show tonight, Friday, May 23rd. Obama and the BlogHer Interview. I've been working on a post that addresses my disappointment with the reception Clinton supporters gave the NARAL endorsement of Obama this past week. I have written a bunch on the topic, but it just hasn't come together. Now that I have seen this video of Obama talking with Erin of BlogHer I think I will be able to finish the post. I sincerely hope that this interview will help clarify issues for you too. Even more important than his answers is that he accepted the offer from BlogHer while neither Clinton nor McCain have accepted the offer made to all three of them. Just the act of accepting the invitation shows that he values the opinions of women and respects the power of both women and the importance of emergent social media.